Be a beautiful bride in this trendy ball wedding gown. The wedding gown is sleeveless and off shoulder. Wedding gowns for rentals come with a veil, bouquet and petticoat (basket). 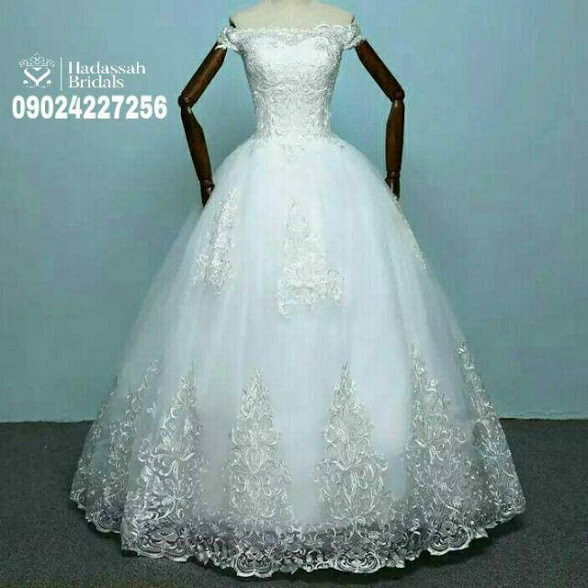 The wedding gown rental cost is #20,000 with a refundable caution fee of #10,000 for weddings in Lagos and #20,000 for weddings outside Lagos. Caution fee is paid back when the rented wedding gown is returned to the store. For wedding gown rentals, pick up and delivery is within 7 days. Kindly contact the store to confirm availability before booking online. Store is Suite 42, Mota Shopping Complex, Opposite Harmony Estate Gate, Ifako, Gbagada, Lagos, Nigeria.